~ A primer for energetic positive self-talk! Sixteen fun and easy “Playercises” guide you through the process of using your words to change your life. These Playercises assist you to say what you really want and need to hear. They are tools that help you to take control of your thoughts and words and be what you want to be. With practice, you can run your life instead of your life running you. You deserve the life of your dreams. Here is how you can create that life! Carolyn White PhD has created her life around solving problems. She has the unique ability to see the big picture and the small details at the same time. Having studied in many disciplines she built a picture of reality that goes beyond the content of those modalities. She realized that language is the essence of life. What and how you talk to others and yourself is the key to peaceful loving relationships. 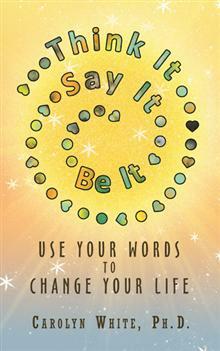 Think It->Say It-Be It: Use Your Words to Change Your Life is available from Amazon and all popular eBook formats.